City of Bavaria, Germany. On April 17, 1528, George the Pious, Margrave of Ansbach, permitted two Jews, Perman and Uriel Wolff, to settle under his protection at Fürth, which was in his territory; and in 1553 the Prince Bishop of Bamberg permitted three Jewish families—probably emigrants from Old Bavaria—to settle at Fürth on a piece of property belonging to the provost of the Bamberg cathedral. The free imperial city of Nuremberg, which had expelled its Jews in 1499, vainly protested against the settlement of a Jewish community in its vicinity; Jews continued to come to Fürth; and after their expulsion from Vienna in 1670, the Bavarian city became more and more a place of refuge for the banished. The two communities which gradually developed in Bamberg and Ansbach were bound together by common internal interests, and tended more and more to fuse into one, especially after 1690. Owing to the rivalry between Bamberg and Ansbach, which manifested itself in part in the granting of privileges to the Jews, the condition of the latter at Fürth was better than elsewhere in the country. Moreover, on March 2, 1719, the cathedral provost of Bamberg confirmed the Jews in all their privileges, and in addition allowed them to send two Jewish representatives to the city council. 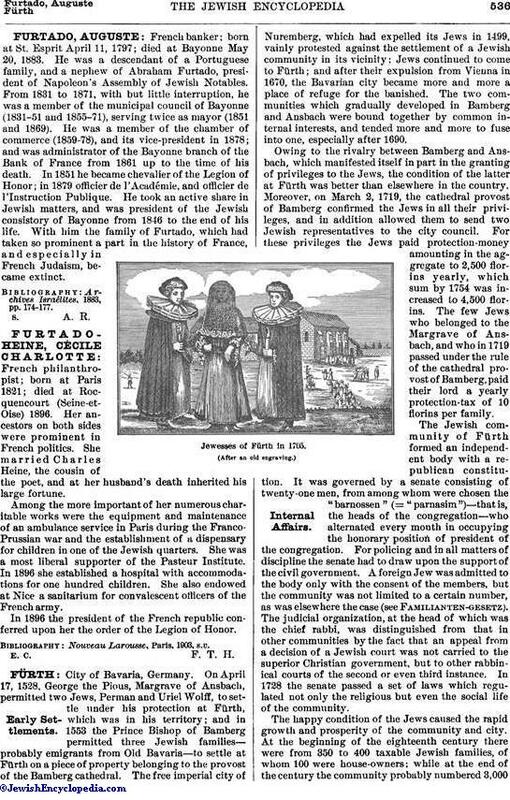 For these privileges the Jews paid protection-money amounting in the aggregate to 2,500 florins yearly, which sum by 1754 was increased to 4,500 florins. The few Jews who belonged to the Margrave of Ansbach, and who in 1719 passed under the rule of the cathedral provost of Bamberg, paid their lord a yearly protection-tax of 10 florins per family. The Jewish community of Fürth formed an independent body with a republican constitution. It was governed by a senate consisting of twenty-one men, from among whom were chosen the "barnossen" (= "parnasim")—that is, the heads of the congregation—who alternated every month in occupying the honorary position of president of the congregation. For policing and in all matters of discipline the senate had to draw upon the support of the civil government. A foreign Jew was admitted to the body only with the consent of the members, but the community was not limited to a certain number, as was elsewhere the case (see Familianten-gesetz). 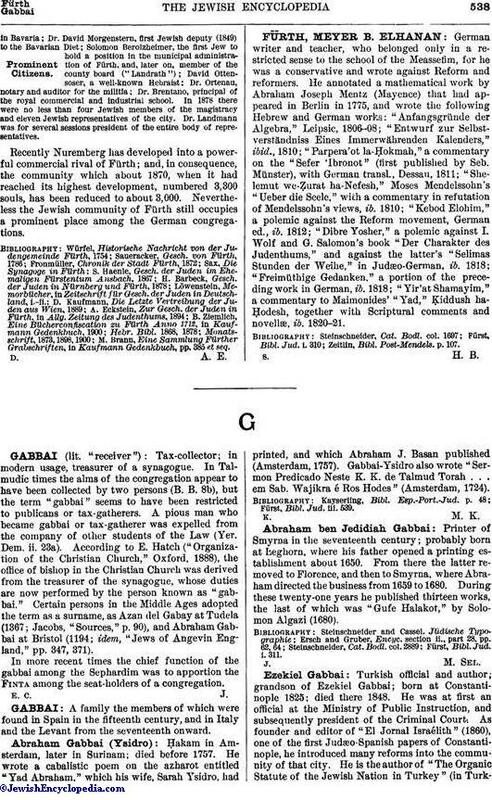 The judicial organization, at the head of which was the chief rabbi, was distinguished from that in other communities by the fact that an appeal from a decision of a Jewish court was not carried to the superior Christian government, but to other rabbinical courts of the second or even third instance. 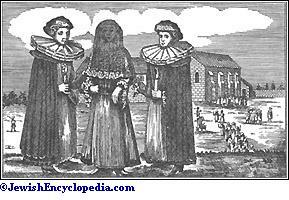 In 1728 the senate passed a set of laws which regulated not only the religious but even the social life of the community. Jewesses of Fürth in 1705. The happy condition of the Jews caused the rapid growth and prosperity of the community and city. At the beginning of the eighteenth century there were from 350 to 400 taxable Jewish families, of whom 100 were house-owners; while at the end of the century the community probably numbered 3,000members. These Jews had commercial relations with many German courts, were engaged to a great extent in manufactures, and monopolized banking. Dohm, in his "Ueber die Bürgerliche Verbesserung der Juden," cites the Jewish community of Fürth as an instance of the fact that those localities are prosperous where Jews are not oppressed. Some Jews became the financial agents of the princes, and Court Jews acquired political influence with the margraves of Ansbach. The most famous of the court Jews was Elkan Fränkel, son of Enoch Levi of Vienna; he was the victim of a court intrigue and of his own ambition, dragging with him in his fall his brother, the cabalist Hirsch Fränkel (1712). In the eighteenth century the family of Gabriel Fränkel—court purveyor and banker—at Fürth carried on very extensive commercial transactions with the Margrave of Ansbach. A favorite of this same prince and a resident of his court was Isaac Nathan, who met with a fate similar to Elkan Fränkel's. Among the later court agents who were preferred by the margraves as financiers and business agents, mention may be made of Meïr Berlin, great-grandfather of Samuel Berlin, the privy councilor at Fürth. Dr. Neubürger, who entered office in 1875, and who is still (1903) officiating. The chief synagogue ("Altschul"), which stands in a venerable courtyard, was built in 1616-17 and entirely renovated in 1865. It contains many valuable memorials of the Viennese exiles who settled at Fürth. 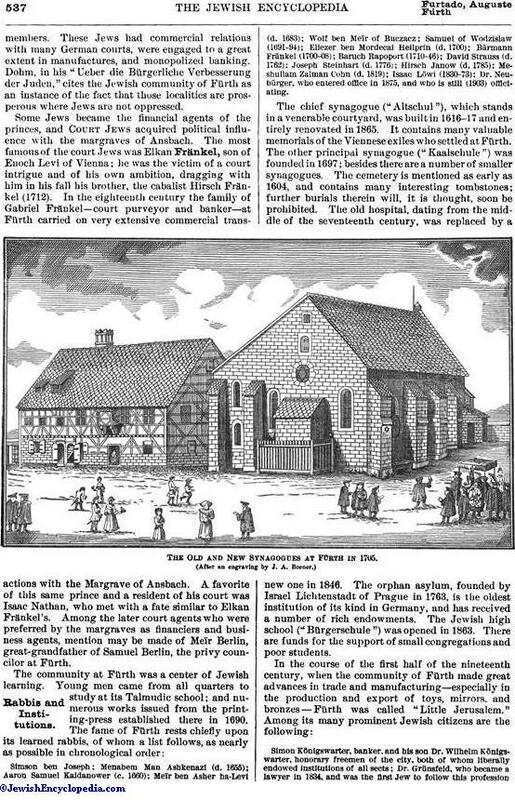 The other principal synagogue ("Kaalschule") was founded in 1697; besides there are a number of smaller synagogues. The cemetery is mentioned as early as 1604, and contains many interesting tombstones; further burials therein will, it is thought, soon be prohibited. The old hospital, dating from the middle of the seventeenth century, was replaced by a new one in 1846. The orphan asylum, founded by Israel Lichtenstadt of Prague in 1763, is the oldest institution of its kind in Germany, and has received a number of rich endowments. The Jewish high school ("Bürgerschule") was opened in 1863. There are funds for the support of small congregations and poor students. 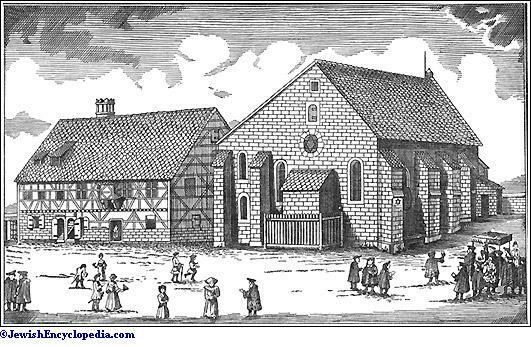 The Old and New Synagogues at Fürth in 1705. Simon Königswarter, banker, and his son Dr. Wilhelm Königs-warter, honorary freemen of the city, both of whom liberally endowed institutions of all sects; Dr. Grünsfeld, who became a lawyer in 1834, and was the first Jew to follow this professionin Bavaria; Dr. David Morgenstern, first Jewish deputy (1849) to the Bavarian Diet; Solomon Berolzheimer, the first Jew to hold a position in the municipal administration of Fürth, and, later on, member of the county board ("Landrath"); David Ottensoser, a well-known Hebraist; Dr. Ortenau, notary and auditor for the militia; Dr. Brentano, principal of the royal commercial and industrial school. In 1878 there were no less than four Jewish members of the magistracy and eleven Jewish representatives of the city. Dr. Landmann was for several sessions president of the entire body of representatives. Recently Nuremberg has developed into a powerful commercial rival of Fürth; and, in consequence, the community which about 1870, when it had reached its highest development, numbered 3,300 souls, has been reduced to about 3,000. Nevertheless the Jewish community of Fürth still occupies a prominent place among the German congregations. M. Brann, Eine Sammlung Fürther Grabschriften, in Kaufmann Gedenkbuch, pp. 385 et seq.